Breit Touch Massage & Bodywork has moved to the Southwood Plaza on 25th Ave S., just off of University Drive S. in Fargo, ND. Southwood Plaza is situated just South of K-mart and right next to the Cajun Cafe. Other businesses you will find within this building are Beth’s Alterations, Kid’s Kingdom Childcare, Your Massage By Jason (with whom I share a space with), Vend-A-Wash, Concepts Creative Hair, and many more. If travelling on Interstate 94, turn South onto University Drive and then turn right onto 25th Ave S; Southwood Plaza is on the left-hand side. Park near the end with the apartment buildings. The entrance to the 2nd floor will be between Vend-A-Wash & Concepts Creative Hair. 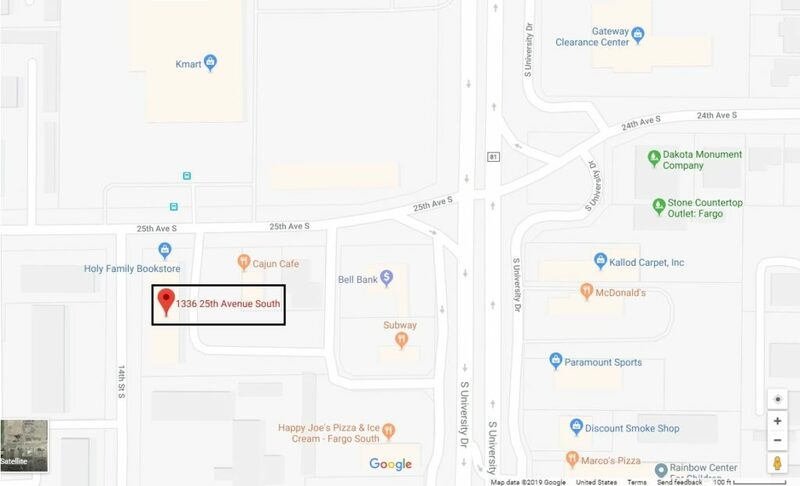 If you are coming from the South on University Dr., take a left onto 25th Ave S (before K-Mart) and we will be on the left-hand side. If you are coming from another direction and you are not familiar with the streets on the map below, or with any of the above landmarks, please contact me for directions.